For years, talk of extending the Red Line to Chicago’s southern-most limits was an urban legend. Longtime African-American residents of the South Side discussed it, but nothing has happened since the public train line, which runs along the city’s north-south racial divide, began operating in 1969. This month, the Chicago Transit Authority took a major step toward securing federal funds for the Red Line extension when it completed a preliminary environmental impact study proposing two options for placement of the line and identifying the properties that may have to be acquired for the project. On Nov. 1, the public will comment on the study for one of the most costly and potentially transformative public infrastructure projects in decades on the predominantly black South Side. At an estimated $2.3 billion and affecting 128,000 people, from middle-class homeowners to public housing residents, the extension could mitigate the effect of transportation policies that experts say historically have supported racial segregation and economic disenfranchisement. The project could create more than 6,000 construction jobs and dozens of businesses at four new proposed train stations along the extended route from 95th Street to 130th Street by the time it is completed in 2026, according to the transit authority. And it promises easy access to public transportation for residents of the isolated and impoverished pockets on Chicago’s southern border. Chicago, IL 60661-1465Public comments are accepted through Nov. 30, 2016.You can read a hard copy of the environmental impact study at local libraries.Click here for a list of libraries. “If the City of Chicago and the region are serious about equity, equity for all of its citizens, then the Red Line extension is the major project to bring that about,” says Lou Turner, who helped lead a grass-roots effort years ago to revive a dormant plan to extend the Red Line, the city’s busiest “L” with 79 million riders in 2015. The Red Line was born of transportation policies that enforced the color lines between black and white neighborhoods, says Turner, who worked with the defunct Developing Communities Project, where President Barack Obama got his start as a community organizer in the 1980s. The line ends abruptly five miles from the city’s southern limits, choking off thousands of poor black Chicagoans on the Far South Side from jobs in the city by limiting their access to steady public transportation. When the Red Line was launched nearly 50 years ago, the story was different. The opening of the Dan Ryan Expressway in 1961 expedited white flight from the South Side, Turner said. The train stopped at 95th Street to keep blacks in their place, literally. “[It] wasn’t going to be some means for black people to follow white people out of the city,” he said. This unofficial role of the Red Line has changed over time. When longtime South Siders talk about the extension of the Red Line, they share the same story. Nearly 50 years ago, they say, then-Mayor Richard J. Daley told residents of the far South Side neighborhood of Roseland that he would extend the train line past 95th Street. But he didn’t. News reports at the time say it was because of a lack of money. The Chicago Transit Authority’s 1958 master plan, New Horizons for Chicago Metropolitan Area, outlined the extension of the South Side Rapid Transit, now the Red Line, well past 95th Street. In 1976, there was more talk of extending the line. Instead, transit officials prioritized the extension of what is now the Blue Line north to O’Hare International Airport. In 2002, Turner worked for the Roseland-based Developing Communities Project, which sought to extend the Red Line. In 2004, the group helped pass a non-binding ballot referendum in favor of the extension. Jacky Grimshaw, a former member of the city’s transit board, says money may have impeded the extension. “When building major projects you have to get federal money, and you can only go as far as federal money will take you,” said Grimshaw, who is vice president of the Center for Neighborhood Technology, a public policy advocacy group. Other new lines and expansions have occurred over the years. The Orange Line opened in 1993. The Pink Line became a separate branch from the Blue Line in 2006. (The southwest bound Blue Line diverged to Park Forest or Cicero.) And the Blue Line was extended to O’Hare in 1984. Today, transit officials say the Red Line extension is a priority for Mayor Rahm Emanuel’s administration, which has already funded some improvements to the line. Noni Arnold starts her day well before dawn. She operates a licensed day care for residents of Altgeld Gardens, a public housing development in Riverdale, where the Red Line extension will end at 130th Street. She started the business because residents were having a hard time getting to work on time. Many of her clients could lose their housing if they lose their jobs. Arnold said it takes about 40 minutes on the bus to get from Altgeld to 95th Street, the nearest rapid-transit hub. On a good day, the wait for the lone bus serving Riverdale is 15 to 20 minutes. For residents of Riverdale, the extension has few down sides. The neighborhood has the city’s highest unemployment rate at 41 percent – five times the citywide average, according to the 2014 Census. Cozart cites Oakland, Calif., as an example of how transit improvements can aid poor communities. The city is building a nine-mile bus rapid transit line through several low-income minority communities to better connect them to jobs and grocery stores in the city’s central business district. Like most major cities, Chicago’s transit history is shaped in part by changes in federal transportation policies. The construction of the nation’s highway system diverted spending from public transit, a main mode of mobility in black communities, to highways, Cozart said. Poor communities of color were designated as blighted to justify razing them and replacing them with highways and expressways, she said. Meanwhile, the disinvestment in public transit, she said, left many minority communities isolated and cut off from economic development and jobs. 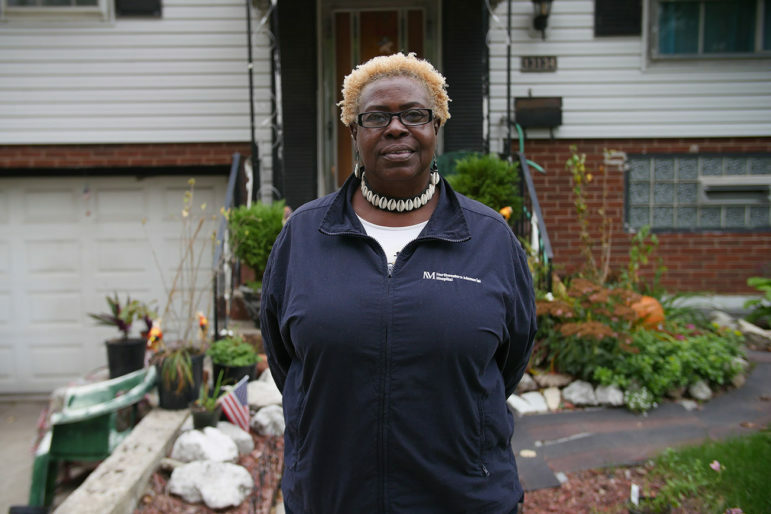 Community organizer Deloris Lucas doesn’t own a car and says taking public transit anywhere from her home in the Riverdale neighborhood takes forever. In Riverdale, faster and efficient transit is not the only thing residents seek. They also want business development along the Red Line, said Deloris Lucas, president of the Golden Gate Homeowners Association, one of four subdivisions, including Altgeld, that make up Riverdale. “There has been no development in this area, period, and the Red Line [extension] would really spark development,” said Lucas, who wants a full-line grocery store, a pharmacy, currency exchange, a library, a dry cleaner and a community center. Advocates, however, caution that any investment in transit must be intentional and comprehensive, especially in communities like Riverdale that are the product of generations of disinvestment. “When you disinvest in a lot of different areas, you’ve got to reinvest in all of those areas,” said Cozart, including preserving affordable housing so people living near the extension are not priced out of the area. Turner and others recognize that the extension of the train line could also trigger displacement of residents with deep roots in the community; 248 properties could be affected based on the line’s placement. Taking land for highways historically has had a negative effect on property values and communities, says Kate Lowe, assistant professor of urban planning and policy at the University of Illinois Chicago, but that could be the opposite with transit. Lowe said the extension could provide benefits like economic activity, redevelopment and access to jobs. Community organizing is key to ensuring transparency and accountability, including monitoring hiring practices and the project’s progression, for the transit agency and elected officials, said Cozart, who encourages residents to develop a community benefits agreement. With 6,000 jobs on the line, local residents should have first-hire priority, and they should be given apprenticeship opportunities in the transportation industry, where African Americans are vastly underrepresented, she said. And local entrepreneurs should have dibs on retail spaces at train stations so they can take advantage of transit-oriented development. The extension also runs through the wards of aldermen Howard Brookins Jr. (21st) and Carrie Austin (34th), who chairs the city’s budget committee. Beale, who chairs the city’s transportation committee, said CTA spent billions of dollars on other projects while the Red Line sat on the back burner. This story is part of a series examining how the proposed Red Line extension will affect residents on Chicago’s Far South Side. Sign up to get these stories in your inbox. Congratulations. The Red Line Extension is much needed for the communities affected. Catch 22. I was a small business owner in this area. But because of rising property taxes, I recently lost my business after 20 years of providing economic development, jobs, and 1 of 23 businesses which paid the majority of property taxes, TIF, and SSA 45 in the 34th Ward. Most of those businesses are gone now, hope it works. with the addition of service on the South Shore as far as Hegewisch. The basic idea is to use the existing MetraElectric tracks, stations, train cars but fare integrated so that they are as universally useful as any other CTA line–flatf ares, transfers, passes. Planting ventra machines on all MED stations within city limits and restoring the four South Shore Line stations where the Red Ex plans to run is cheap and something that could be done in less than 2 years. In terms of Roseland, bothe MED mainline and Blue Island Branch, almost every MED station is served by CTA buses so riders could choose the route best suited to their trip. Focusing on Roseland and Altgeld Gardens with the Red Line Extension is myopic, looking at small improvements for a couple communities rather than for the larger City and nearby suburban travel needs. Metra already serves many southside communities including South Chicago, Burnside, East Side, Jeffery Manor, Longwood Manor, Washington Heights, Beverly, Rosemoor, Pullman, West Pullman, and Morgan Park. The lack of fare coordination, mandated by the State but ignored, is an impediment to better utillzation of existing Infrastructure without spending $2.3b that could be put to better use elsewhere. Service would be improved greatly with better coordination with Metra, and especially with the Gray Line whereby CTA would purchase service, trains, crews, and use of facilities, from Metra. Beside CTA bus connections, Gray Line service would meet Pace buses to 95th at 115th & Cottage Grove, 121st & State, and 121st & Halsted. Pace buses #355, #358 & #364 terminatng at Hegewisch could be extended to the Gray Line at 115th. With the Red Line terminating at 95th. both 95th and 103rd buses terminate rather than run through past the ME and RID respectively to offer better convenience to south and southwest suburban destinations as well as destinations along the lakefront or Sox Park, and Downtown. Admittedly funding would be needed for ticket vending and maybe turnstiles, elevators for ADA compliance at elevated statios, additional railcars and additional passing tracks on the Blue Island Branch; but this pales in comparison with the extension cost also requiring these and many more elements.